To travel to Pangkor Island, you have to enter Malaysia first. There a few options to enter Malaysia. We will explore the different types of Malaysian transport for you. First you can fly to Kuala Lumpur or Penang, you can come by road from Thailand or Singapore. For details you can also visit the Malaysia Tourist Information in the city you arrive. Flying to Kuala Lumpur is possible from all parts of the world. Malaysia Airlines has services from almost everywhere. At Kuala Lumpur International Airport (KLIA), you have to transfer to the domestic airport. Flights leave from Kuala Lumpur from the domestic airport Subang Jaya, not from KLIA. 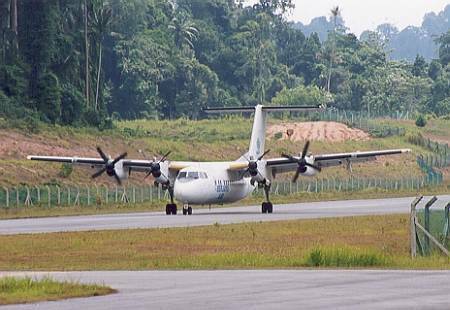 Berjaya Air is operating on a DeHavilland Dash 7 (48 seats) aircraft between Subang Airport (SZB) Terminal 3 and Pangkor Airport (PKG), on Pulau Pangkor. It makes travel to Pangkor easy, pleasant and fast. The flight takes about 40-minutes. It offers great views of the West Coast of Malaysia and the Straits of Malacca before landing at Pangkor Airport. There are 5 flight a week. All the flights leave Subang airport at 11.30 and arrive at 12.10 midday. A ticket to Pulau Pangkor cost RM 428. It is possible you want to fly to Ipoh. There are daily flights at 17.35 and 21.50. It takes about 45 minutes. Going back from Ipoh is also possible. The flight schedule for flying to Kuala Lumpur is 6.45 and 18,45, daily. If you want to fly to any other destination in Malaysia, you will have to fly back to Kuala Lumpur and transit. It is easy to travel to Pangkor by car. However, driving a car in Kuala Lumpur can be a little nightmarish because of the traffic jams, especially during rush hours. Keep in mind in Malaysia the driving direction is as in the United Kingdom. From Kuala Lumpur to Lumut is about 250 km. You can travel to Pangkor from the North. It is about 200 km from Penang International Airport. If you are taking the North-South Highway, there are few exits that you can use. The easiest exit will be at Changkat Jering. If you take this exit you will be driving along the old road. There are some little towns on this route you will pass. Follow the direction Lumut, Sitiawan. At Ayer Terjun you take the junction to Lumut. It's a straight road that passes Pantai Remis and Segari. Just before Seri Manjung you take the junction to Lumut. 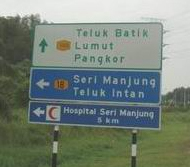 Other exits are Kuala Kangsar, follow now the road to Kampong Tanjung and Ayer Tawar. It is possible to drive from Ipoh, take the exit Gopeng. Follow Batu Gajah (road number 5, Ayer Tawar and Sitiawan. You will find the instructions further by following the signs to Lumut. An additional note for you if you travel to Pangkor with your own car. There are many places to park your car. The price range from RM3 to RM10. Most of the carparks charge RM10 but try to park behind Hotel Indah (which is facing the sea) which charge RM3. To travel to Pangkor by bus you have to head to Puduraya. At this bus-station you buy your ticket to Lumut. The ticket cost about RM16 for a super deluxe VIP bus and take approximately 3 to 4 hours. We have collected more information on the bus journey our bus page. After arrival in Lumut, you have to take the ferry to Pulau Pangkor. The ferry leaves every 15 minutes during the day. It takes about 40 minutes to the ferry port of Pangkor Town. The fare is RM 10 for a return. Travelling to Pangkor/Lumut is easy and fast. For driving from the KLIA-airport to Lumut, exit the airport using Airport Road. After about 3.km you will see a few green expressway signs. Follow the sign to Ipoh; Sungei Buloh. You are now on the North / South Expressway travelling North. Take exit 135 Jeram, Batu Gajah, Gopeng (km marker 297. From here it's another 70 km to Lumut. Follow first the direction of Batu Gajah. You will see soon markers with Lumut and Damai Laut (white boards with green letters). The roads are generally in good condition though sometimes a bit small. Berjaya Air is operating on a DeHavilland Dash 7 (48 seats) aircraft between Subang Airport (SZB) Terminal 3 and Pangkor Airport (PKG), on Pulau Pangkor. It makes travel to Pangkor easy, pleasant and fast.